The key to surviving each wave of zombies in Zombie Gunship Survival is to upgrade your weapons and base. Both the gunship and soldiers have their own unique weapons that can be upgraded and fused to improve their traits. This guide will explain how to scrap, boost, and fuse weapons in Zombie Gunship Survival. In Zombie Gunship Survival, weapon upgrades and modifications are done through the Hangar Workshop. To access the Hangar Workshop, return to your base and locate the Hangar. Select the Hangar and then click the Workshop icon at the bottom of the screen. When you open the Hangar Workshop, it will display all the weapons that are currently available to equip on your soldiers and gunship. Weapons that are already equipped in your loadout will have a yellow badge beside them in the Workshop. Clicking and highlighting a gun will bring up the stats for that weapon, which includes its base power, damage, blast radius, reload time, and rarity level. The Hangar Workshop allows you to equip, scrap, and boost weapons for your soldiers and gunship. Upgrading weapons requires the use of both Metal and Screws, which can be obtained by opening weapon crates or completing missions and objectives. Scrap weapons that you have duplicates of or that you no longer need so that you can continue to improve the weapons that you use the most. Unwanted weapons can be scrapped to earn additional Screws, but keep in mind that once a weapon is scrapped, its gone forever. Tap the Boost button in the Hangar Workshop to level up a weapon in Zombie Gunship Survival. To upgrade a weapon in Zombie Gunship Survival, select the gun in the Hangar Workshop and tap the Boost option. This allows you to increase the level of the selected weapon based on the amount of resources you want to spend. When you upgrade a weapon, its stat differences will be shown along the right side of the display. 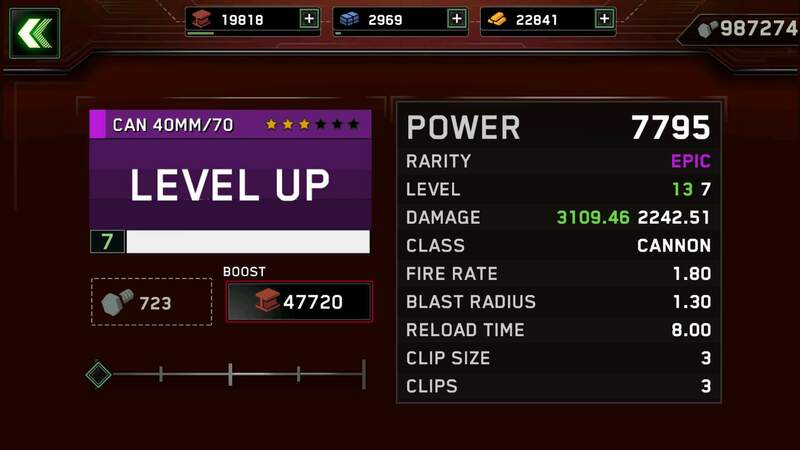 Once you have reached the maximum boost level for a weapon, it can be fused with other weapons of the same star rating to gain additional stars and improve its traits. If you see a gatling gun icon appear above your Hangar, it means you have a max level weapon in your inventory that's ready to be fused. Epic and Legendary weapons tend to have the best traits to begin with, so focus on boosting these weapons first to ensure you maintain a powerful arsenal in Zombie Gunship Survival. Upgrading and fusing weapons is a simple yet effective way to improve your survival capabilities in Zombie Gunship Survival. Check out our Zombie Gunship Survival tips to get even better at this epic mobile game!